Purposeful Pathway is a haven for faith-based entrepreneurs. It is a journey in which faith and business gracefully intertwine. It is a pathway paved with purpose, peace and passion. The posts provide insights for faith-based business and also inspiration for the spiritual journey. My hope is that, in reading, your businesses will grow and your lives will be enriched. 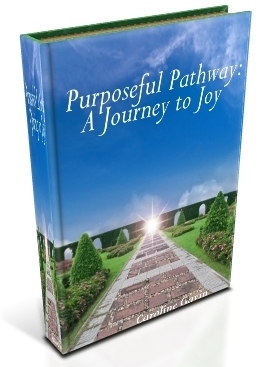 My prayer is that these messages will allow God’s peace, love and joy to pave your purposeful pathways. Part of my mission is equipping faith-based businesses with information that is practical, actionable and Scriptural. The theme of this post is pain points and power points. I am passionate about spreading joy through the Gospel message. But you may wonder why I am so passionate about this. Although there is much into which I can delve regarding that question, I will provide a relatively short answer in this post. I went through some very painful experiences as a child, and I therefore grew up with self-loathing. This sense of worthlessness expressed itself in severe depression and also a severe eating disorder, specifically anorexia nervosa. The chief psychiatrist in a prestigious hospital said I was the most depressed child he had ever met; he had been working in the field for some time and had met with many a child, so this was quite the distinction. I spent a good number of my teen years and early adult years in the 50 to 60 pound range. Yes, I was literally 50 pounds and, quite frankly, on the verge of death. I hated myself so much on a subconscious level, and this was the outward expression. The only balm to the excruciating pain of life was being thin – no, the thinnest. To take that balm away would be to leave me with pain that felt worse than death. Although I was very functional in work and in school, the depression continued until I became born again in the Spirit of God. This is, of course, a greatly abbreviated version of my pathway. Yet the power of the point remains: God is One of transformation. Now, by God’s grace, I hear frequently from others that I am the most joyful person they know. I am also very healthy and on fire for life. I nurture and nourish my body, the temple of the Holy Spirit. A physician once told me that I could never have children due to the damage of the anorexia; but, by God’s mercy, I have experienced two healthy pregnancies and have given birth to two beautiful children. Due to the anorexia, I once suffered from osteopenia, anemia, generalized anxiety disorder, seizures and a host of other illnesses. God has healed every single ailment. My life is a miracle; even more miraculous is the joyful, healthful and purposeful quality of my life. In light of this, sharing joy and wholeness in Christ is extremely important to me. I know how painful it is to have no joy and no meaning and no purpose; if God can transform me, he can transform anyone! God has taken my pain point and transformed it into a power point for His glory. Another pain point for me had been attracting clients and having a consistent flow of income while doing the work to which God called me. God has also shifted this pain point to a power point, and so I now help other Christian entrepreneurs succeed in sharing their gifts. I help them to attract ideal clients, powerfully package services and also systematize their efforts so they can enjoy fun, fruitful and profitable businesses. I am able to share God’s Word not only through my own ministry efforts but also through a powerful ripple effect. When I help my Christ-centered clients succeed in their businesses, I help them to use their unique gifts to reach countless lives with God’s Message. (If you are interested in a free program for attracting clients, I invite you to join the newly-released 21-Day Attract Clients NOW Challenge.) Helping Christian entrepreneurs involves a beautiful intersection of my experiences, my skills and my passions. My purposeful pathway, therefore, is working with others to pave their own purposeful pathways. There are a couple points of my sharing these pain and power points with you. The first is that you may appreciate more deeply why I do what I do. The second is that you may appreciate that you have pain points and power points too! The most powerful things we can share in our businesses – and indeed our lives – often revolve around our former pain points. The Bible verse 2 Corinthians 12:10 states: “That is why, for Christ’s sake, I delight in weaknesses, in insults, in hardships, in persecutions, in difficulties. For when I am weak, then I am strong.” Let us embrace our crosses, for God converts them to crowns. Let us sow our tears, for we will reap with songs of joy. Compose a list of two columns. On the left side list your pain points; on the right side list your corresponding power points. If you have not arrived to a place of power with a certain pain point, pray about this; God is very likely leading you to victory in this area. The very areas in which we struggle are often the very areas that bring success and fulfillment and fruit. Connect with your story. I shared some of my story with you, and I am confident that you now have a deeper appreciation for what I do and why I do it. I encourage you to do the same: bring more of YOU – the trials, the challenges, the victories, the successes – into your business. People want to connect with people not just processes. Yes, they are looking for results. But, with the vast array of choices to obtain those results, it is powerful to distinguish yourself as not only a result-giver but also a three-dimensional person. Exposing your vulnerabilities allows others to see how you relate to their pain; it also reveals the power of the transformation you have experienced. Review your pain and power point list and then write a compelling story to share consistently in your business. These exercises will enrich your business and your life; they will also bless those whom you touch while bringing glory to God. Thank you for allowing me to share some of my story with you; I look forward to learning how your pain points and power points inspire and transform others! What are some of your pain points and power points? Leave a Comment. I like the idea of listing the pain points in one column and the power points in the other column. Even if we don’t feel power, the Holy Spirit power is available to empower us to have victory in every area of our lives. Yes, the Holy Spirit can indeed empower us in all areas of life! His strength is made perfect in our weakness. You are a radiant example of how God converts pain points to power points!